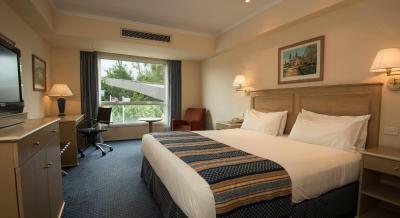 Lock in a great price for Holiday Inn Cordoba – rated 8.4 by recent guests! This is a convenient hotel if one has a flight the following day out of COR. I would come back. Beds were OK. Rooms were clean. Wi-Fi was free and worked well. And the best part was that I arrived at the hotel at 11 PM and the restaurant was still open! That was crucial for me! Good general location close to airport, and major shopping complex within walking distance. Breakfast buffet had a great variety and I think everyone could find sth for themselves. The room was comfortable and I was happy about getting a crib for my baby. Nice staff, especially Josefina. El profesionalismo y amabilidad del personal; la amplitud y accesibilidad de la cochera, la practicidad del checkin, el dispenser de agua, la amplitud del lobby, pasillos y cuarto y la cantidad de cuadros y obras de arte que hay por doquier. Holiday Inn Cordoba This rating is a reflection of how the property compares to the industry standard when it comes to price, facilities and services available. It's based on a self-evaluation by the property. Use this rating to help choose your stay! 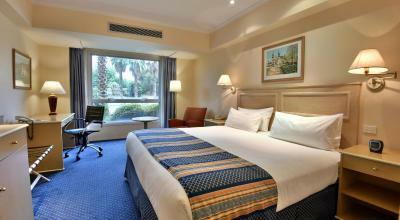 One of our top picks in Córdoba.Conveniently located just 10 minutes drive from downtown Cordoba, Holiday Inn Cordoba offers 5-star accommodations with air conditioned rooms, free internet and free parking subject to availability. 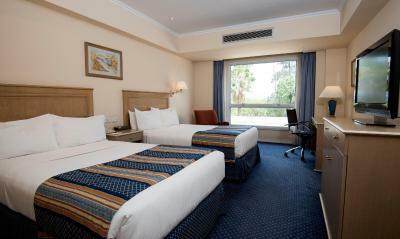 Rooms are well-equipped and include an LCD TV and work desk. Bathrooms are fitted with both a bath and shower. Holiday Inn Cordoba offers a range of facilities for guests to enjoy, including a swimming pool, sauna and fitness center. In addition, there are car rental and tour desk facilities on site. The Cordoba International Airport is just 15-minutes from the hotel and the Cordoba Mountains are a 45-minute drive away. 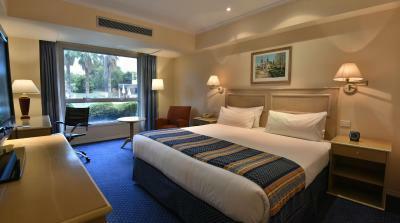 When would you like to stay at Holiday Inn Cordoba? 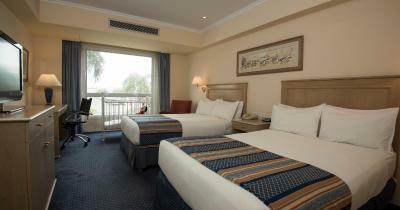 Features double-glazed windows, free Wi-Fi, work desk, plasma TV, mini-bar, safety deposit box and air conditioning. Features twin beds, free Wi-Fi and a private bathroom. Features a separate seating area, and free Wi-Fi. 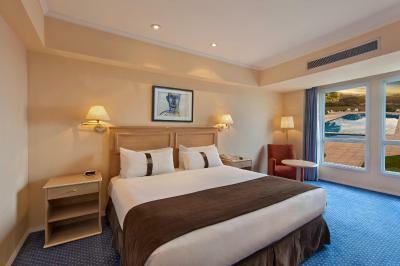 This room features great views of the pool and free Wi-Fi access. A comfortable room with air conditioning, cable TV and a private bathroom with a shower and free toiletries. Features hill views, double-glazed windows, free Wi-Fi, work desk, plasma TV, mini-bar, safety deposit box and air conditioning. Spacious room featuring hill views, free Wi-Fi and work desk. This suite has air conditioning, mini-bar and cable TV. House Rules Holiday Inn Cordoba takes special requests – add in the next step! Holiday Inn Cordoba accepts these cards and reserves the right to temporarily hold an amount prior to arrival. Access to the hotel is very bad and hard to find, specially at night. Service at bar and restaurant abysmally slow - took ages to get serviced both at the bar and restaurant- 3/10 for service! The service at the front desk is VERY slow. It seems that the Holiday Inn system is quite cumbersome. Everyone was friendly though. By vehicle can be a little difficult to enter. The check in process was a bit long as I booked one night via booking.com and then added one night directly through hotel reservation services.